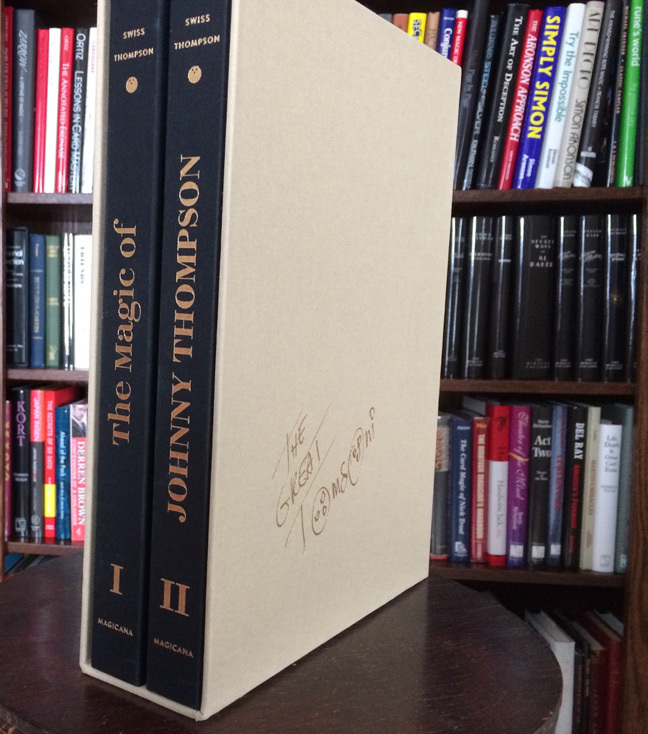 How do you even begin to review The Magic of Johnny Thompson Volumes I and II? First, I suppose, you drive down to the word store and load up on superlatives. Every aspect of these books is first rate, and their contents constitute a graduate course in close-up and platform magic. At over 600 pages written by Jamy Ian Swiss and Johnny Thompson and illustrated with over 1100 photos by Julie Eng, with David Ben and Karl Johnson on hand to edit, this is a staggering work. Latest resident in the library. I'll give a quick overview and then concentrate on some bits I found special. Volume I contains the chapters The Gambler's Ballad, Harry Riser (8 items), Ed Marlo (5 items), Balls in the Net, Mixed Macs, More Cards (7 items), The Benson Bowl, Miller & Malini (11 items), and The Egg Bag. 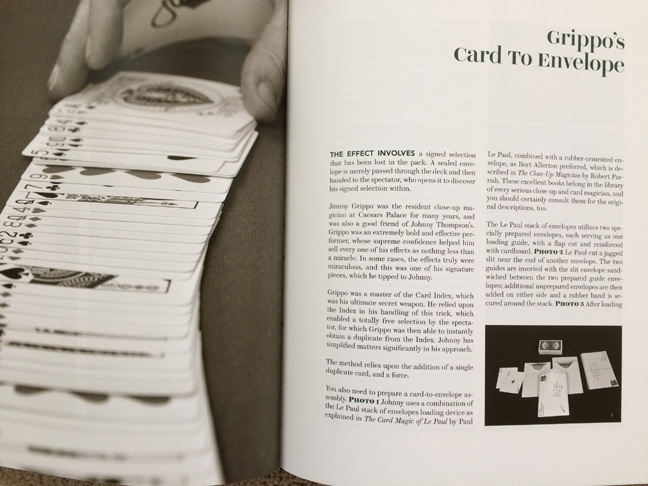 Volume II contains The Cups and Balls, More Coin Magic (3 items), Dai Vernon (4 items), Color Changing Knives, Even More Cards (9 items), Mentalism (3 items), Illusions (4 items), The Great Tomsoni & Co., and The Trade Show Act. While others will consider the classic routines, such as the Balls in Net or The Egg Bag, to be the highlights, for me it was the many small refinements, or surprising card tricks I knew nothing of before. A few examples follow. The Riser-Thompson routine The Ambilipstrous Card is an easy and effective Ambitious Card routine. I've recently been intrigued (example: Thirteen in Harry Lorayne's Jawdroppers!) by the ruse of counting or spelling to the fourth card as dictated by any card the spek draws from the deck. Johnny's routine significantly expands your options. There are at least three items from T. Page Wright. Five Senses is a multiple selection routine in which each card is revealed via a different sense. I predict that many will employ the finale, a Charlie Miller idea. The chapter Mixed Macs contains a complete act of card tricks with aces, a most accessible routine. Consider Shuffling to the Aces, Cutting the Aces, Spectator Cuts to the Aces (nice versions),Triumph, The Assembly (McDonald Aces, with new touches including from Persi Diaconis), and The Travelers (all signed, last card in envelope). The oldest trick in the world? The Cups and Balls is Johnny's extended routine that he performs assuming the identities of Max Malini, Pop Krieger, and Dai Vernon. While most won't attempt the complete drama, there are plenty of individual sequences from which to form a sensational routine. I particularly enjoyed the Jamy Ian Swiss final load (the loads enter the cups a step ahead of the Vernon sequence, the false explanation is eliminated, and the three balls really are under the cup), the Jacob Daley sequence (the fruit passes through a cup), and the Danny Dew vanish (the wand spin causes three balls to vanish). The Classic Force is a great lesson on how to get into the force. Quadruple Coincidence is a red deck/blue deck coincidence trick that contains a baffling false cut. Super easy, one of my favorite take aways from the books. Grippo's Card to Envelope gets the signed card into the envelope before it vanishes from the deck. I've always favored envelopes over wallets, and this is one of the best versions I've encountered. The Scoot is the deck switch many of you will find the easiest and most effective to do. Parrish the Thought is a double card stab of cards spread beneath a newspaper. The first "professional" magic trick I learned was a similar item from Dunninger's 100 Houdini Tricks You Can Do. I've a soft spot for this plot, and this is a great instance. I had recently seen a video clip of Johnny performing Triumph, and I was struck by a new-to-me bit for reversing half the deck prior to the climax. I wondered if that would be in the book. It is! Page 288 of Volume II, near Photo 26. The Great Tomsoni & Co. details Johnny's and Pam's iconic stage act. I love card tricks and am happy that there is a wealth of them in the book, and I have no personal interest in dove magic. But wow, reading this chapter gave me a vastly more appreciative perspective on this classic comedy act. This boxed set of books is massive (think the Caveney books, or Tenyoism), and the presentation more than lives up to the quality of the information. Jamy's prose is inspired, and he is meticulous about squeezing every scintilla of critical advice from Johnny's vast repertoire. His instruction is clear and oozes respect for its source. Every trick opens with a full-page shot. I could go into raptures over the physical appearance of the books, thanks to Julie Eng's layout and her hundreds of brilliant photos. Virtually every trick opens with a gigantic, breath-taking full-page shot of Johnny's hands performing the routine, and the dozens of smaller photos that follow clearly lay bare its secrets. At Magicol Julie is exposed to the work of Michael Albright, and you can see that influence. She's that good. 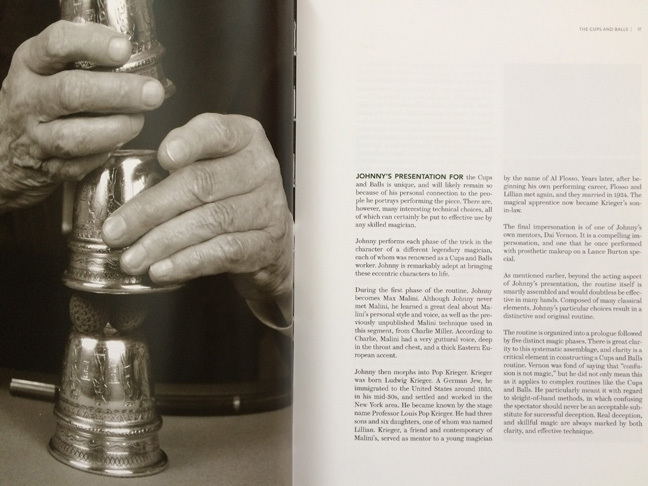 The forewords and introductions, spread over the two volumes, are from Jamy Ian Swiss, Teller, Lance Burton, and Levent. Johnny should be very, very happy: these are brilliant, heartfelt pieces. And The Final Word is from Johnny Thompson himself, whom we all thank for living this life, for learning so much, and for sharing the whole shebang. Johnny even autographed every set, as did The Great Tomsoni. Well done. Hardback, 340 pp (Volume I), 324 pp (Volume II), 12.5 by 9.25 in, $295 plus $25 postage from Magicana and select dealers. I purchased mine directly from the publisher.